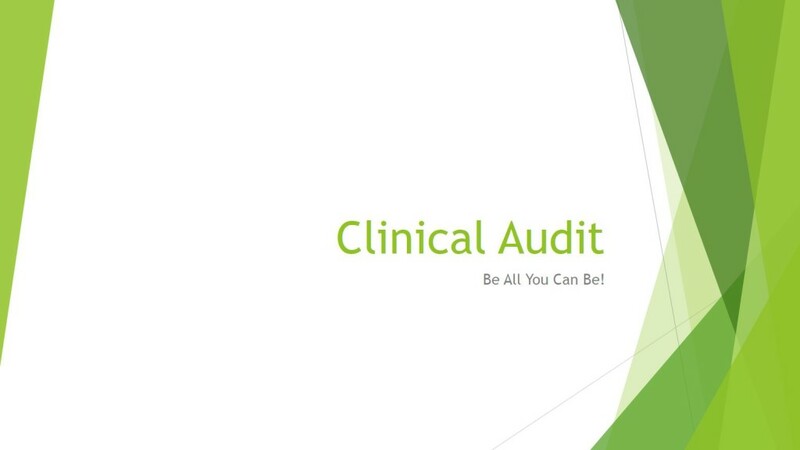 Here is my presentation on clinical audit. WHY SHOULD I CONDUCT CLINICAL AUDITS? In addition, clinical audit can contribute to job satisfaction for all members of the veterinary healthcare team. Taking active steps to assess the effectiveness of one’s practices and implement change and then seeing the results of those efforts can give veterinarians and veterinary nurses a greater enthusiasm for their work, and a sense of confidence in their clinical decisions. There are two basic types of clinical audit, though the specific goals and procedures are tailored to each setting and question. Standards-based audits are those which compare current practice and results to some designated standard. 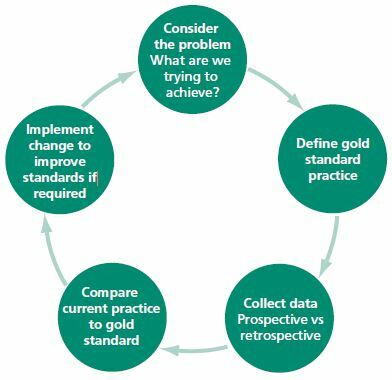 The standards can be goals set specifically for the practice or derived from published clinical guidelines or other external, evidence-based sources. A standards-based audit could evaluate how often antibiotics prescribed for urinary tract infections turned out to be appropriate based on subsequent culture and sensitivity results, with an eye to adjusting empirical antibiotic choices if necessary. Or such an audit could be focused on ensuring a certain percentage of newly-diagnosed cases of feline chronic kidney disease were fully staged according to the published IRIS guidelines.5 Or one could use a process audit to evaluate patient outcomes, such as the proportion of spay surgeries experiencing seroma or other complications, with the goal of optimizing practices to minimize these. Critical Incident or Significant Event audits are structured discussions that occur in response to some identified error or process failure or simply an undesired outcome. Such events can be clinical, such as an anesthetic death or patient escape in the hospital, or they can be procedural, such as a failure to submit a urine sample for culture or to report biopsy results in a timely manner. The goal of a significant event audit is not to assign blame but to determine if any feature of hospital policy or procedure might have increased the risk of such events and how this risk might be reduced through any process changes. HOW DOES CLINICAL AUDIT WORK? The specific steps in a clinical audit will be somewhat different in every setting. However, there are some general principles that apply broadly to the audit process. For audits to result in meaningful, effective change in practices, the entire healthcare team must be convinced of the value and legitimacy of the process. This requires participation and input by all team members, rather than an authoritarian “top-down” approach. Having clear and transparent procedures agreed upon in advance for how audits are to be conducted and a regular, consistent execution of these procedures will facilitate creating an institutional culture in which audits are seen as a routine and necessary part of patient care. The general steps of the audit process are illustrated in Figure 1. The process begins by identifying a question or area of concern to investigate. All members of the team should be invited to offer questions for consideration and an open discussion of these and how to structure and prioritize this should be held involve the entire team. Individuals or a small team responsible for a particular audit should then identify guidelines or standards to be used as benchmarks and develop a plan for collecting appropriate data. This plan should again be discussed with all members of the team who will be involved to make sure it is appropriate and not unduly complex or burdensome. Once the data is collected, it should be analyzed to compare the results to the designated standards. Audits are not intended as clinical research projects, and no statistical analysis is necessary or appropriate. The goal is to compare the results in the practice setting clearly and directly with the designated guideline or standard in a way that identifies potential areas for improvement. Since the overall purpose of audits is to facilitate improvement, when an audit identifies practices that do not meet the designated standard, the entire team should again be involved in formulating a plan for implementing changes to improve performance. Once these are well established, a repeat of the audit cycle can be sued to assess whether the changes have had the desired effect. Though audits are not intended to be a form of controlled clinical research, they do have the potential to produce data useful to those outside the practice in which they are conducted. The results are specific to the environment in which the audit was conducted and so cannot necessarily be generalized to other settings. However, in the evidence-poor environment of veterinary medicine, clinical audit can at least suggest hypotheses about best practices or the impact of clinical practice guidelines and provide at least rough estimates of the frequency of some outcomes in various settings. Therefore, sharing the results of clinical audits is to be encouraged. This also has the added benefit of making clients aware of the active quality improvement processes in place, helping to build confidence in the practice. There are a number of barriers to conducting clinical audits. The biggest in the U.S. is the lack of awareness of the audit process. Clinical audit is well-established in the human healthcare system in various forms. 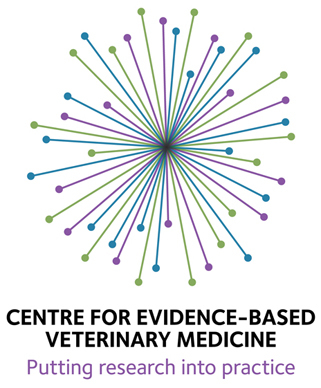 And in the U.K., veterinary practices are required to have some formal mechanism for assessing outcomes and improving performance, which can be satisfied by a clinical audit mechanism. 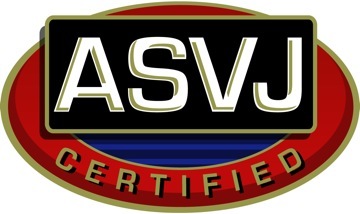 However, there is not widespread awareness of the value or methods of clinical audit among veterinarians in the U.S.
Other practical barriers include time and other resources, resistance to change from team members, and concerns about the impact of identifying errors or undesirable outcomes on employee performance evaluations or client confidence. All of these are limitations that have been successfully addressed in the implementation of clinical audit in human medicine and that can be overcome in the use of this valuable tool in veterinary medicine. Viner, B. Introducing clinical audit into veterinary practice.PhD. dissertation, Middlesex University, London, England. 2006. Jamtvedt G, Young JM, Kristoffersen DT,O’BrienMA,Oxman AD. Audit and feedback: effects on professional practice and health care outcomes. Cochrane Database Syst Rev 2006;(2):CD000259. Dunn, J. Clinical audit: A tool in defense of clinical standards. In Practice. 2012;34:167-169.
International Renal Interest Society (IRIS). IRIS staging of CKD (modified 2013). Available at: http://www.iris-kidney.com/guidelines/staging.aspx. Downloaded October 8, 2015. Viner, B. Using audit to improve clinical effectiveness. In Practice. 2009;31:240-243.